Lamb and peas, peas and lamb.. I haven't decided who the star in this recipe is, but it's definitely a heavenly combination! Cook the frozen peas for about 4-5minutes in boiling water.. Keep 1/4 of the peas aside and puree the rest in a processor.. In a deep pan, heat a little olive oil & butter.. Cook the onions until they are translucent, add the garlic and cook for another few minutes.. Add the rice and combine all ingredients well, then deglaze with white wine, and once absorbed, add a little stock.. Cook until it's absorbed and repeat the process until your risotto is almost done (a few minutes until readiness).. Now add the pea puree and cook your risotto al dente (pls no mushiness!).. Don't forget to season as your cooking.. In another pan, heat a little olive oil & butter, add the rosemary twig and cook for a few minutes to flavour the pan.. Season lamb and cook for about 1-2 minutes on each side (for medium) then place on a heated plate.. Deglaze the pan with red wine, cook on high heat, add the stock, a knob of butter, season and keep it aside..
Once the risotto is ready, add the remaining peas, mascarpone and Parmesan, sprinkle with parsley and it's ready to plate! 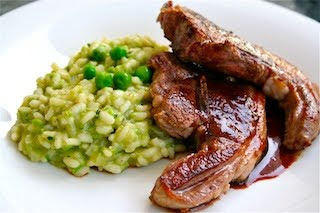 Place lamb loins on the risotto, pour the sauce over it and voila - delicious!